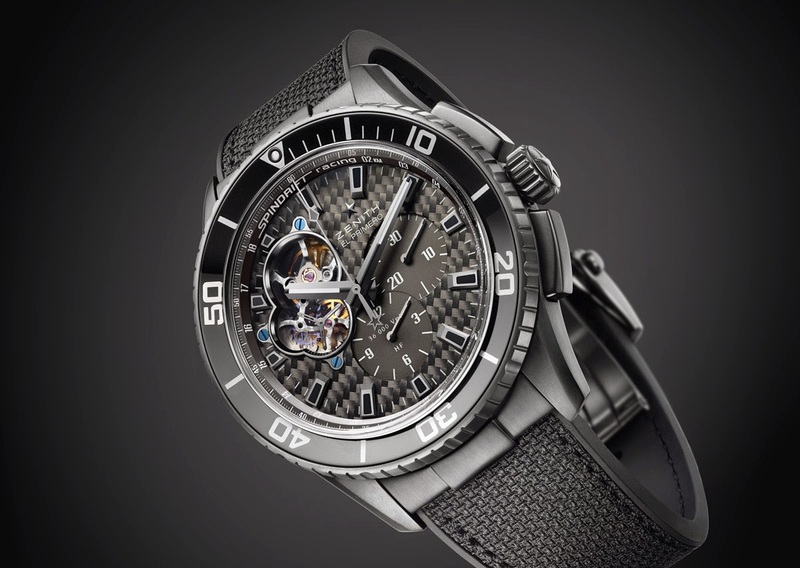 As the official timekeeper for the Spindrift racing team during the 2014 Route du Rhum, Zenith has enriched its El Primero line with a new chronograph in tribute to this transatlantic single-handed yacht race that takes place every four years between Saint-Malo (France) and Pointe-à-Pitre (Guadeloupe). The Zenith El Primero Stratos Spindrift Racing is the first Stratos model line to feature a dial with the opening onto the escapement at 10 o’clock. It also introduces a telemetric scale, useful to calculate the distance of a visible and audible phenomenon, positioned on the inside face of the inner bezel ring. 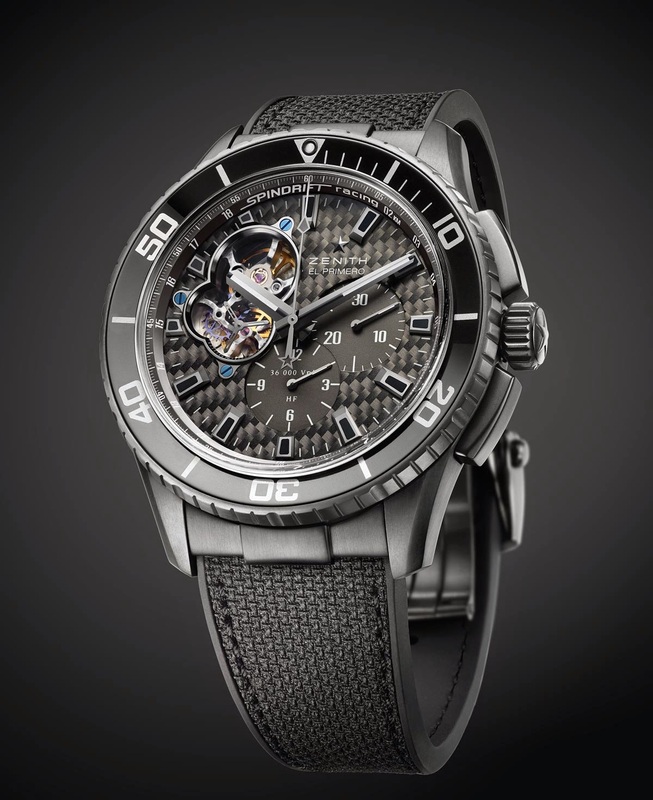 The inscription "Spindrift racing" at 12 o’clock and the team logo engraved on the oscillating weight remarks the connection between this sports watch and the sailing world. The masculine 45 mm case features a rotating bezel with aluminum disk and it is available in rose gold and DLC titanium with a black dial or in stainless steel with DLC coating with a carbon fibre dial. The matt black DLC (Diamond-Like Carbon) coating is not only aesthetically appealing but it also makes the watch very resistant to scratches. 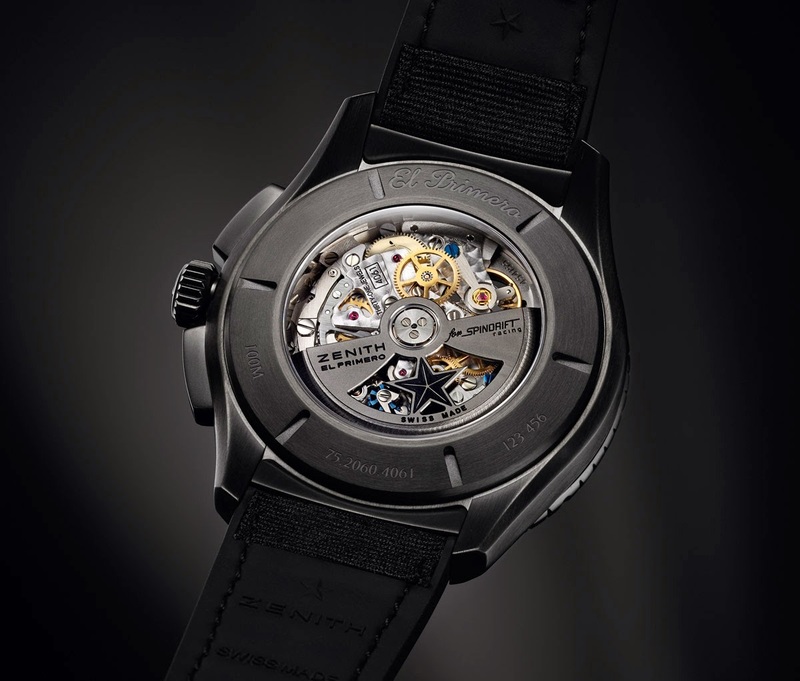 The high-frequency (36,000 vph) automatic movement is the celebrated column-wheel El Primero 4061 equipped with a lever and escape-wheel in silicon. Silicon is much harder and lighter than steel, which makes it both resistant to wear and tear and less energy intensive, due to its low friction coefficient. It is also non-magnetic. The power reserve is 50 hours. The strap of the Zenith El Primero Stratos Spindrift Racing is composed of a fibre fabric inserted into a rubber core, a robust solution for a watch which is water resistant to 10 ATM. Prices start from about Euro 7,200 / US$ 9,100 for the DLC-coated steel version (ref. 75.2060.4061/21.R573) up to about Euro 17,600 / US$ 22,600 for the rose gold and titanium model (ref. 86.2060.4061/21.R573). 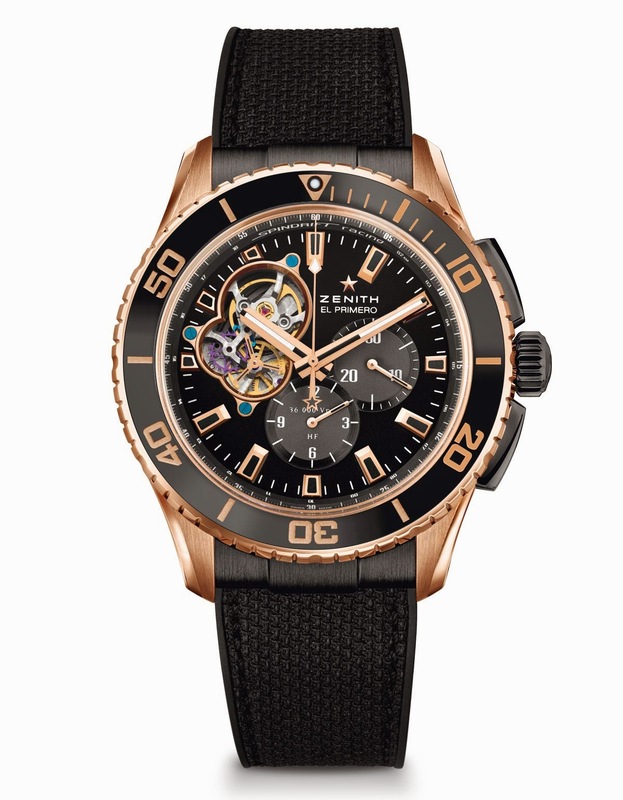 Zenith El Primero Stratos Spindrift Racing. 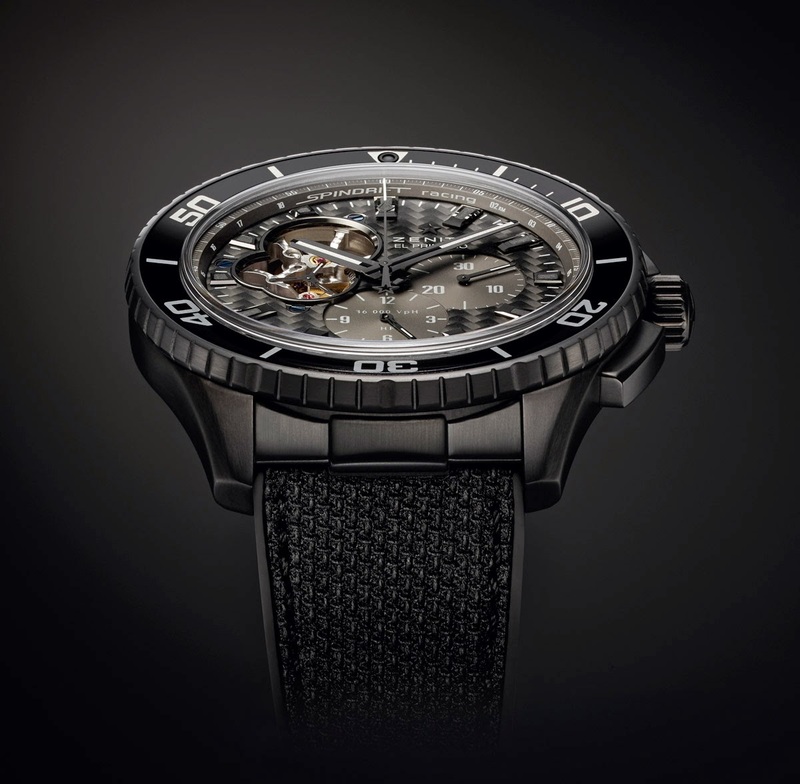 As the official timekeeper for the Spindrift racing team during the 2014 Route du Rhum, Zenith has enriched its El Primero line with a new chronograph. 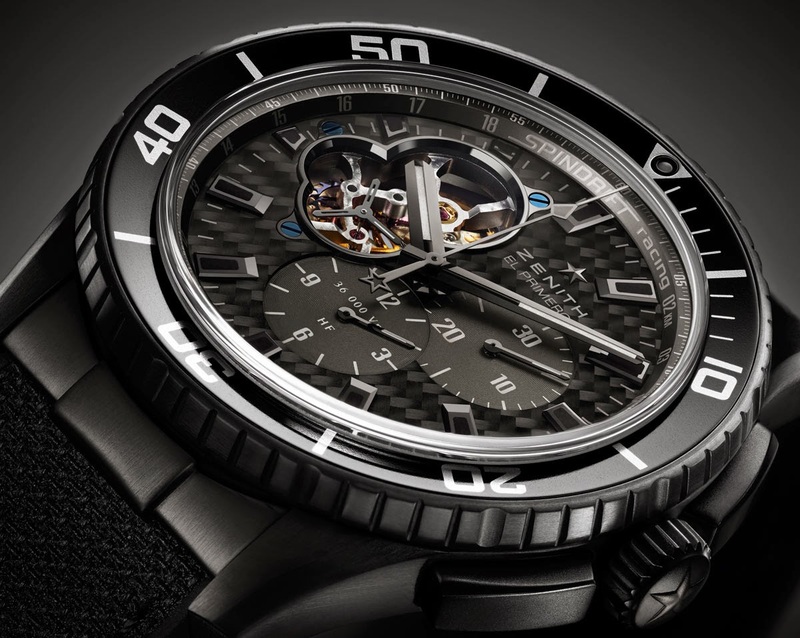 The Zenith El Primero Stratos Spindrift Racing is the first Stratos model line to feature a dial with the opening onto the escapement at 10 o’clock. Prices start from Euro 7,200 / US$ 9,100 for the DLC-coated steel version (ref. 75.2060.4061/21.R573) up to Euro 17,600 / US$ 22,600 for the rose gold and titanium model (ref. 86.2060.4061/21.R573).